Was that it? Anyone who’s ever stood at the side of a road to watch cycling’s Tour of Britain coming through their locality knows the experience can be a bit of an anti-climax. Blink and you miss it, sometimes. 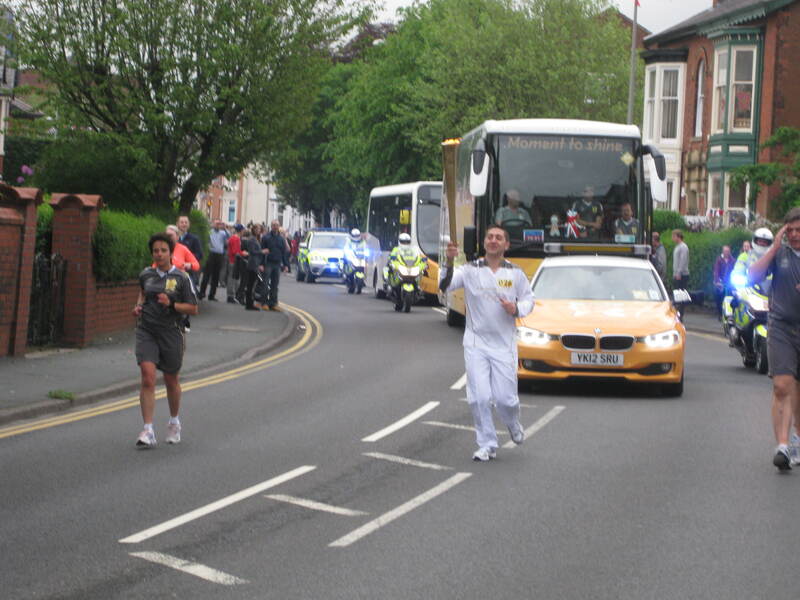 But there was at least a little time to savour the Olympic Torch relay as it reached Chorley on Friday, June 1st. I guess I got my hopes up a couple of weeks back when I saw how much time Olympic hero Ben Ainslie had with the torch as he left Land’s End at the start of the relay, giving everyone within 200 yards a good sniff of flame, so to speak. Yet it was all over a lot quicker in Downtown ‘Charley’. One of our friends – further along the route from us – likened this morning’s historic moment with a far more intimate act, involving lots of build-up then … well, let’s not go there. Besides, having never tried that on a Chorley street corner I couldn’t possibly comment. As it was, the crowds were certainly out and about ‘early doors’, as Ron Atkinson would say, as the relay crossed the Lancashire border. Of course, proud Lancastrians in Bolton and Horwich who point-blank refuse any allegiance to the modern administrative county of Greater Manchester will be ‘up in arms’ (as they say in newspaper circles) at that last statement, but BBC Radio Lancashire made a big noise about the torch entering the Red Rose county at Adlington this morning, and that’s good enough for me. Meanwhile, the Wyatt clan were across town, looking for a suitable spot on Southport Road as the Spirit of Prometheus drew ever closer to our neck of the woods, leaving Chorley and making towards the People’s Republic of Euxton. And it all went rather swimmingly really. Well, kind of. The better half and I were already pepped up for Operation Breakfast by the time our alarm went off, and my eldest was not far behind, her own clarion call following. That just left my youngest, refusing to budge from her pit until her own alarm sounded. But she eventually joined us, just as the toast starting popping. And within half an hour we were on the road out of Daftown. I admit feeling slightly guilty that we hadn’t taken to our bikes, not least after overtaking our retired neighbour lycra-ed up en route. But with two of our party set to leave for school by 8.40, it was never really going to happen. With the crowds growing as we climbed the hill to this proud Lancashire market town, I started to wonder if there’d a be a parking place left for us before the roads closed, but we managed to find a gap not far from the home of double-Abbot Ale victors Chorley CC, and were soon on a street corner awaiting the big moment. Around 15 minutes later the first section of the relay cavalcade approached, the police motorbike out-riders followed by a coach-load of torch-bearers (not a euphemism) and a few corporate sponsors in buses. Come to think of it, I’m sure I saw John Terry up there celebrating on top of the blue Samsung double-decker as they passed through. After all that excitement, and a fair bit of blaring PA, it all went a bit quiet save for the big group waiting to see Helen Clarke do her stint with the torch, the Bolton special school teacher soon in place and awaiting her hand-over. Then we see the next wave of out-riders, and before we knew it, York’s Ian Dawson was heading our way. By that point, my eldest had confessed that she’d forgotten her mobile phone and so took charge of the camera on mine, but – with comedy timing – both myself and my youngest then realised how little power there was in our own cameras. Note to self: always charge up your cameras the night before any ‘historic moments to remember’. I managed to squeeze out a few shots, but quite frankly should have done better (as you’ll see from the evidence). Either way, it was all over far too quickly and Ian was soon back on the official bus after a few celebratory family hugs, with Helen already away into the distance towards a town mis-pronounced ‘Yookston’ by generations of badly-informed broadcasters. You can’t level that at Radio Lancs though, who were definitely on the ball and by that stage had stand-up comic, jogging juggler and all-round good bloke Steve Royle running after torch-bearers looking for would-be interviewees. We were back in the car by then, trying –unsuccessfully – to steal a march on all the other drivers thinking the same, being passed by members of the superb and suitably-gothic Stone The Crows morris dancing troupe on at least three occasions while crawling out of Chorley. Around half an hour later we finally made it home, the toast long since polished off and my eldest despatched for school in good time. Job done. Well, there’s something to tell your grand-children one day. 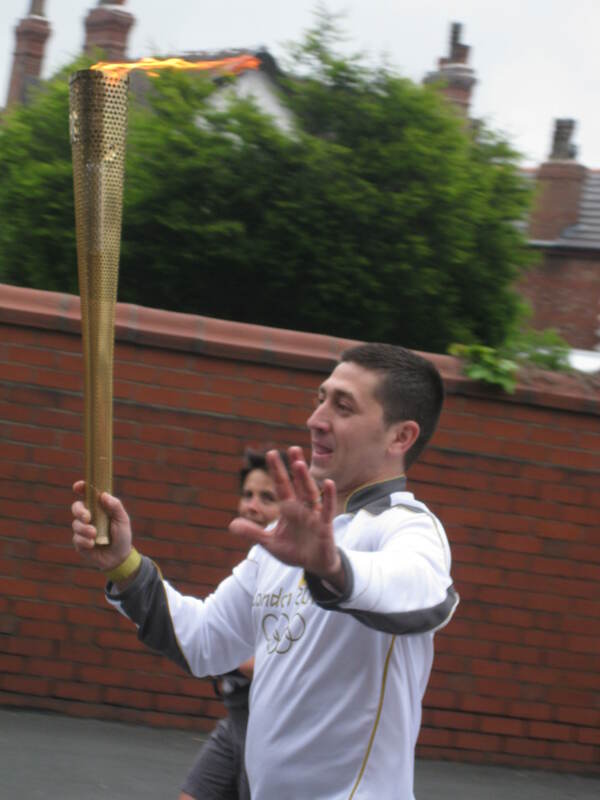 This entry was posted in sport and tagged chorley, ian dawson, lancashire, Olympics, steve royle, torch relay. Bookmark the permalink.